Someone once told me that weeds are flowers growing where they don't belong. 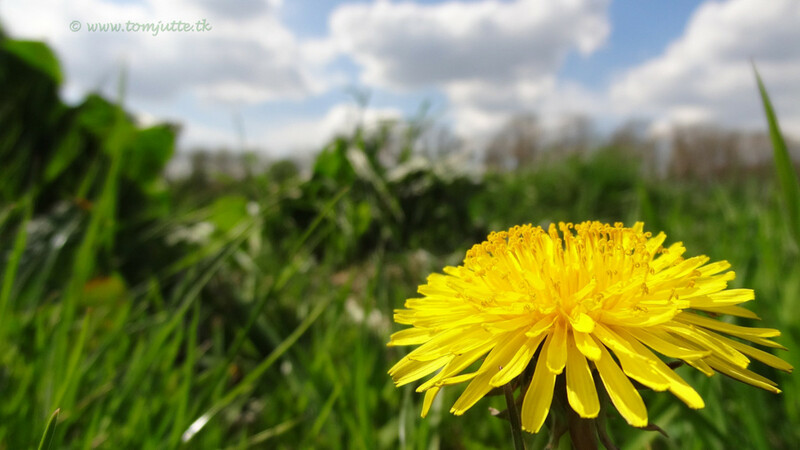 It's not uncommon to see cattails, goldenrod and dandelions growing in ditches along with many other flowers, but most of us wouldn't want those 'flowers' growing in our flower beds. On the same token, weed trees are trees growing where they don't belong. 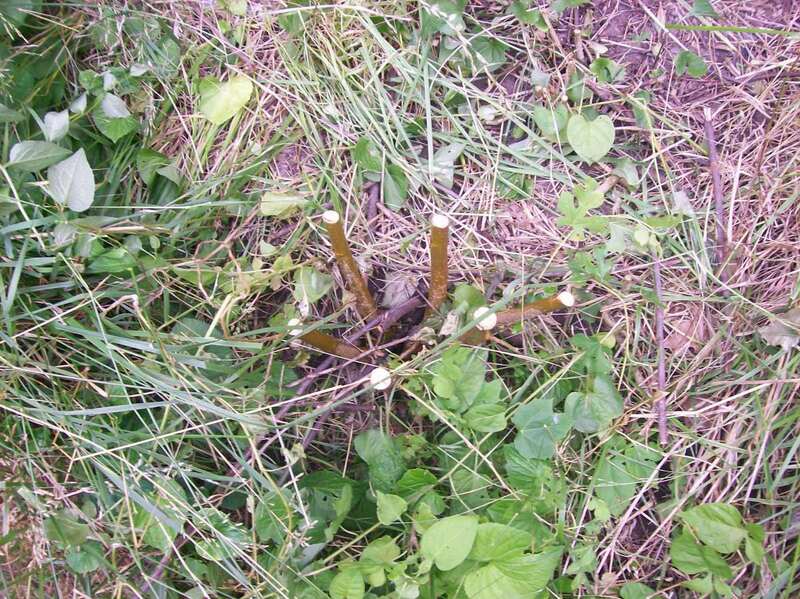 There are several types of trees that have the tendency to have seedlings growing in your yard where you least expect them. Two of these are the tree of heaven and the black walnut tree. If you have either one of them as larger trees growing anywhere in or near your property, then you want to be on the lookout for more of them growing where they don't belong. You may find maple trees or oaks or some of the trees most would welcome in their yards growing where you didn't plant them, but not as many of those as the tree of heaven or the black walnut tree. The tree of heaven and the black walnut look alike, but the main difference is that when the tree of heaven is cut down it smells atrocious, not a heavenly fragrance at all. We used to call them stink trees. 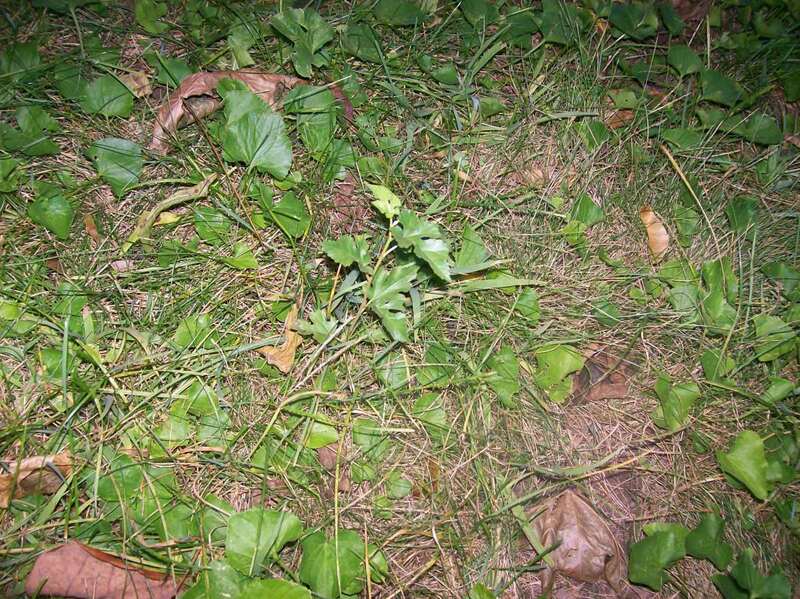 Weed trees appear in your lawn or garden by birds or wind, and I don't think it matters how much you pay attention they may show up at any time, even when you thought you had them all taken care of. They will be in plain view in the front yard, back or hidden anywhere you don't look very often. I try to watch for them when I am mowing my lawn. When I see them in the midst of the grass, I mow around them, for I have found that if I mow them down they will continue to grow, but be thicker and even harder to get rid of. 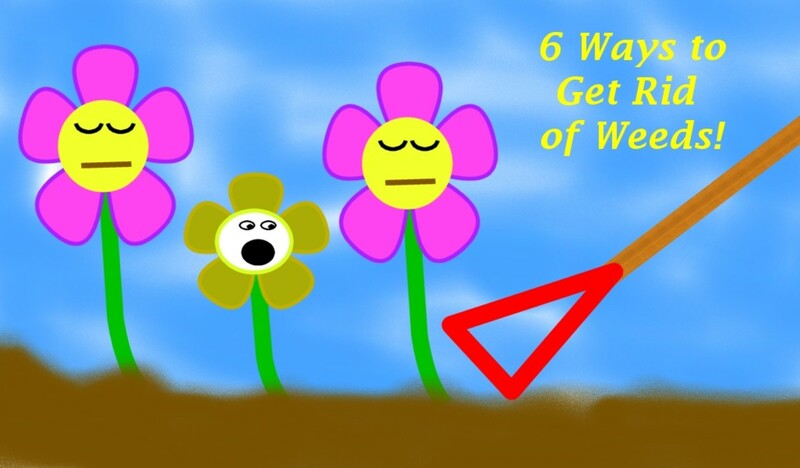 It also helps to walk around your yard and garden periodically to be on the look-out for any saplings that may appear. It's easier to get rid of them when they are extremely small. Recently I've found them in the form of suckers at the base of trees that I thought were already killed. I had several that once the branches were cut down, again, had trunks about three foot up that were obviously dead, yet the suckers at the bottom were quite alive and growing profusely. I believe they come to your lawn either from larger well-established trees that are already in your yard, or from trees found in your neighbors yards. They may even be carried by birds or the wind from a bit farther away, although I don't know how far away that may happen. Would You Like a Free Tree in Your Yard? It could be, though, that your yard does need some trees and you happen to find a seedling growing in the middle of your lawn in a place that you would have planted a tree. If you like the location, before you decide to leave it there, you may want to clip off a piece of it including the leaf and make sure you know what kind it is. Many home and garden stores would be happy to help you determine what tree you have. Some cities may even have a small mom and pop type store that has even more knowledge than the larger chain stores. Whichever store you take the cutting to, hopefully they will be able to help you decide if it's a tree you really want to grow in your yard. The reason you want to do this is that if it is the black walnut or the tree of heaven you will end up with not only one tree but half a dozen or more that you don't want growing in the places they show up in and it would be much easier to plant a likable tree in that spot than keep the tree that might cause you stress later on. 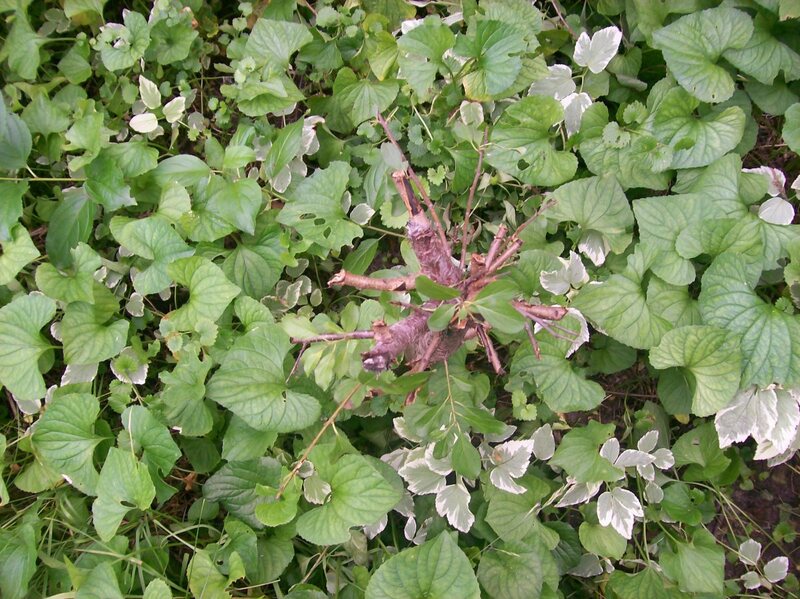 Some things to consider would be whether that tree has a problem with certain types of bugs, or whether it will continue to drop seedlings all around your yard or flower beds. Believe me, having to keep your eye out for weed trees is no easy task. If you don't find them within the first year or so they may develop a strong root system making it seem impossible to be able to dig out of the ground at a later date. Another factor is how tall the tree usually gets, whether it will shade your home nicely in the hot weather, or whether it would be better to have a tree growing in a different spot for that purpose. Another reason you might want to know the average height would be if you have electrical lines near that area in your yard. You wouldn't want a storm to cause a mature tree to fall into those lines in the future, causing you to potentially lose power. What about the root system? 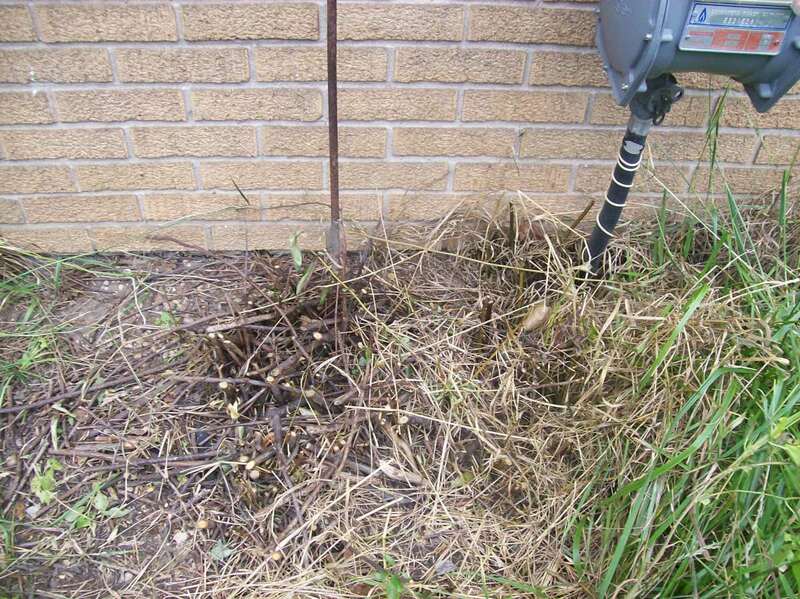 Is it similar to a willow tree where the roots stick up from the ground making the area unsightly? I currently have several red maple trees on the outlawn of our front property. The roots protrude up from the ground near the tree, making it quite difficult to mow the lawn. They don't travel on top of the lawn like a willow tree will, but it still is ugly looking. At the side of the garage. The top is dead, but the bottom continues to produce new shoots. A new weed tree from last year; hopefully we've nipped it in the bud early enough. I believe these are a lilac bush, evergreen tree, and walnut tree, which were all intertwined and growing as one. I think this is the same one but showing more of the shoots that keep growing even though part of the stump is dead—or at least looks that way. Weed tree that I've tried different methods to kill it, it appears dead, but keeps trying to produce lower to the ground. Another view of the one in back by the screened porch, this one has a view of new shoots also. Weed trees not cut down yet, right next to house. I'm not sure whether this is another black walnut tree or something similar. Whichever it's still in a bad location. Black Walnut tree trying to hide among the violet leaves that also don't belong. Weed tree that still has the poison intact. This one and one other was protected by a lilac bush that I'm not destroying. The other side of the lilac tree which hid another treated weed tree. On the side of the garage, I think. The evergreen bush by the meter and closer to the camera a cut black walnut. I have five areas around my house where weed trees are growing. They all aren't located in flowerbeds. One decided to grow within my lilac bush. One could be a decent tree if it was growing in a better place. It happens to be growing within several inches of the wall of my garage. I do hope that one day we will be able to tear the garage down and build a larger garage further back on the property, but in the mean time I don't want this tree to force me to take down the garage before we are ready. All of these, other than the one in my front lawn and one by my front porch are growing too close to the house, or garage. So in my book they have to go. Is Chopping Them Down Enough? No! Be prepared to have the time to do more with them after chopping them down. If you chop them down and don't treat them in one way or the other, then the next year or so you will be right back where you began, although the trunk will probably be even thicker. 1. One option is to paint the top with nothing other than 'paint' to stop the regrowth. 2. Another is to peel away the bark of the tree. How does this help you might ask? The nutrients flow from the base of the tree to the top and to the different branches. It needs the bark on the tree to help keep the nutrients in the tree. 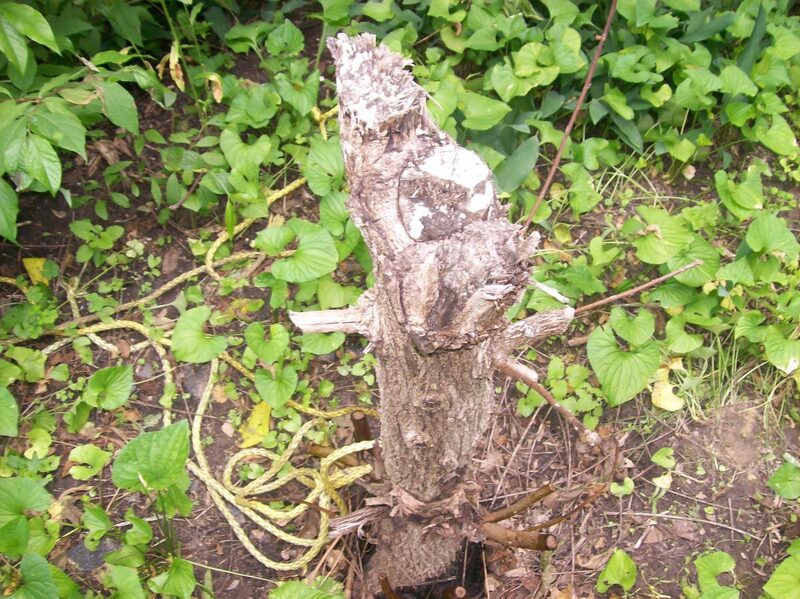 When the bark is peeled off, the nutrients will leech out of the trunk causing the tree to die. This may take some time for the results to take place, so if you are tired of waiting until you see the desired results, or if the tree is shaped in such a way that peeling the trunk is nearly impossible, or if you don't want to cut yourself doing this another option is to cut the tree, preferably at a height that you can get to. This can be done with tree trimming cutters if the trunk isn't too thick. If the trunk is too thick for the cutters, then you'll have to use a saw. Make sure you've used a saw before, or let someone help you. After it is cut, 'paint' onto the cut area a chemical for killing weeds such as a Roundup product or something similar. 3. Another is to find some chemical to use, again on the surface of the cut to kill the tree that way. This should be a last resort, depending on the chemical used. Certain chemicals make it impossible to plant anything else in that area for several years. The first few times I was so disgusted with certain weed trees that just wouldn't die after trying several things that I finally cut off the top and poured household bleach onto the top of the cut. I was surprised to find out how well that worked and it didn't seem to affect the rest of the weeds growing there, (unfortunately). The chemical that I purchased last year, and again this is something that prohibits growth for several years, is a product called Tordon RTU. © It's a specialty herbicide for controlling unwanted trees. I purchased it last year and used it for the first time this week. I was going to take pictures of the trees after application as the solution is blue in color, but it's rained since and I'm not sure the color will still show up. 4. Another option to use as a last resort is to pour salt on the open cut of the tree. Salt will kill the tree for sure. The only problem is that if you were hoping to plant anything else there when the tree is gone, it could be several years before the salt is totally leached from the ground, allowing anything else to grow. 5. One final option is finding a professional, or someone with a truck and chains to loosen the dirt around it and pull it out. That option is usually more expensive, for those that can afford it that might be the best option. On the other hand, if the tree is growing close to the foundation, I'm not sure whether it would be safe for your house to take care of it in that manner, as you don't want to find out the hard way that the roots from the tree have already broken into the foundation. Why Would a Home-Owner Want to Remove These Trees? 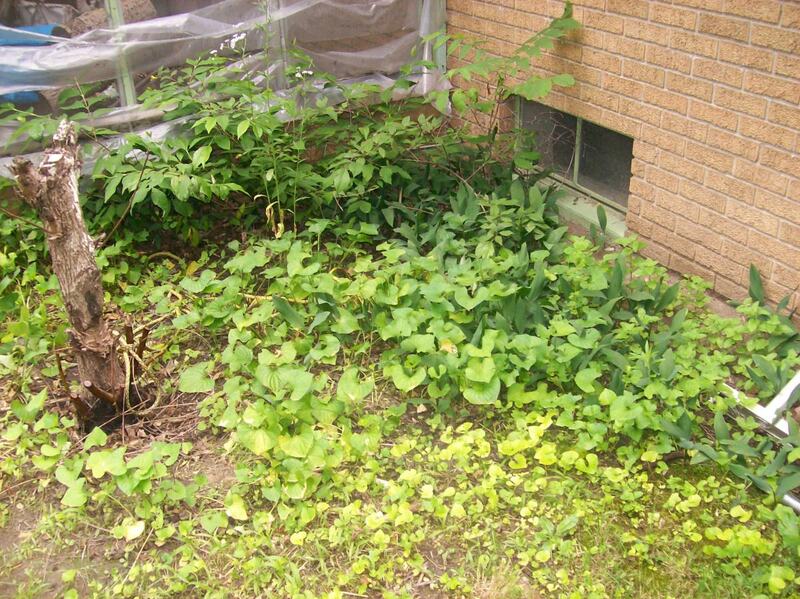 The main reason is that they usually grow in unwanted places like in garden beds, or too close too the house. 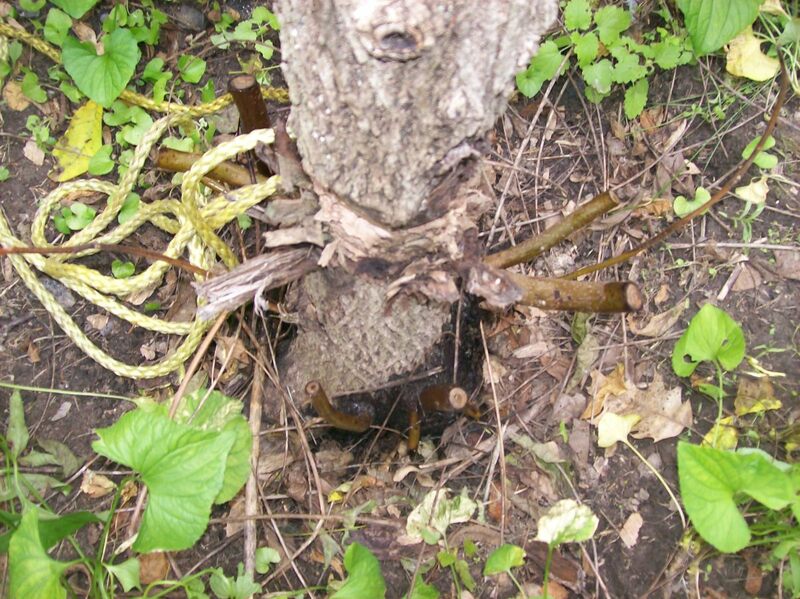 It's best to keep most trees away from the foundation so the roots don't get too close and break the foundation below the ground level. This happened in a home we rented long ago. The tree was growing between the driveway and the house about two feet from the house. Eventually, the tree began to angle toward the house getting closer every few years so that the roots broke into the foundation. Trees that are too close to homes and are not well-groomed can also destroy sections of the roof or shingles themselves. They can also cause small saplings to begin growing in the gutter itself, as can be seen on many homes around the countryside. 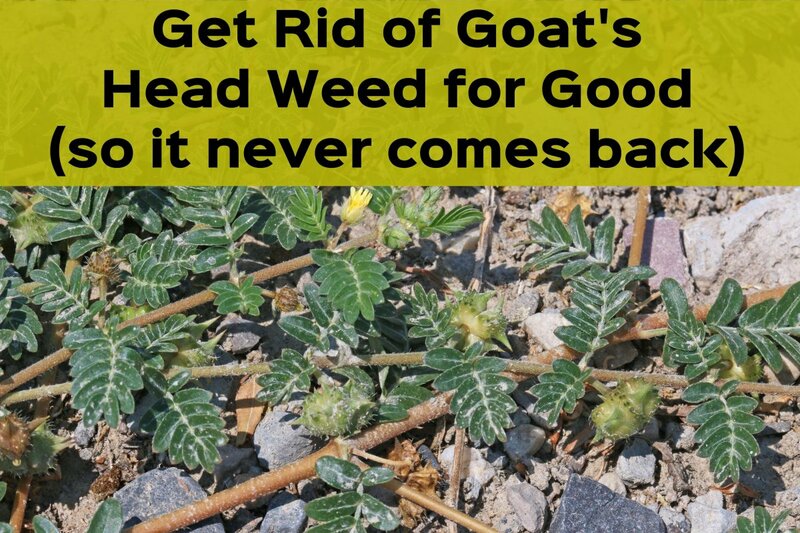 In summary, weed trees are trees growing where you didn't plant them and where they don't belong, whether it's too near your house, in your flowerbeds or in the wrong place in your yard. Keeping them from growing on your property takes time and perseverance, and not giving up. They are much easier to remove when they are tiny seedlings, so keep a close watch around your yard. If they have taken over the area, first try removing the bark. Then cut an area off the tree and paint on a weed killer. If for some reason it needs to be taken care of immediately, because you've noticed the roots getting too close to the foundation or something similar, then pour salt on the wound of the cut of the tree, but remember nothing else will grow in that location for several years, plus you don't want the salt to blow onto other plantings. 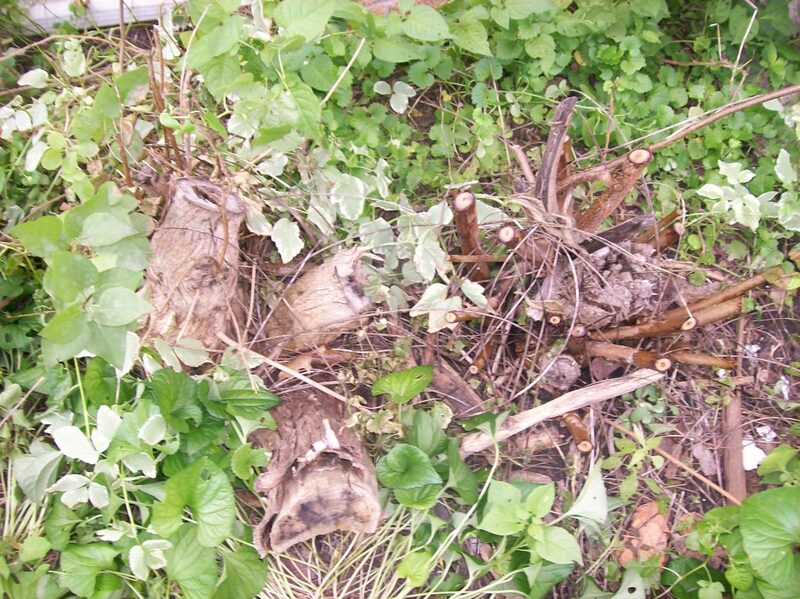 Do You Have Any Unwanted Trees in Your Yard or Garden? Please let me know in the comment section or by email if you see anything that I've worded incorrectly or other problems in the mechanics of this article. 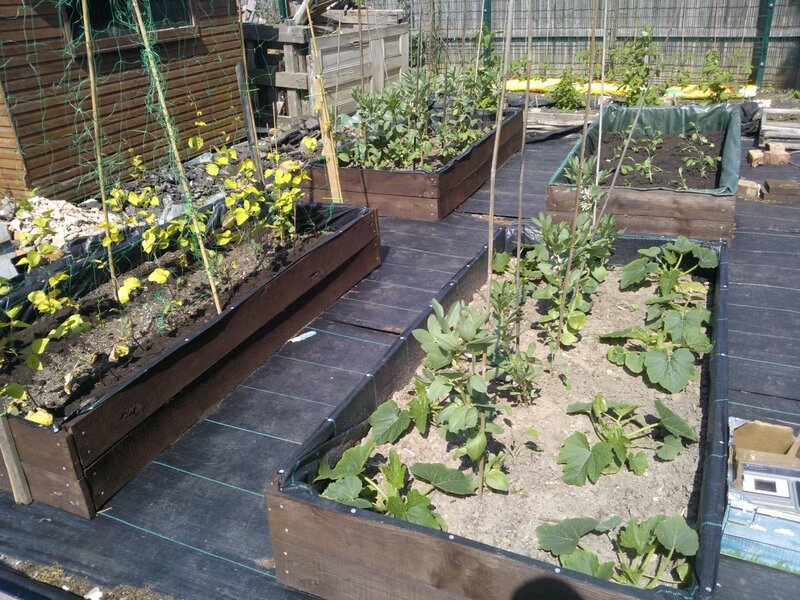 I have been unable to garden for two years due to back and knee injury. I live one block from a lake with a variety of trees. I now have trees growing that are 8 ft tall in my garden. I have 20+ roses bushes and Perennials that have been planted for twenty years. How do I get rid of these trees without damaging my rosebushes and Perennials? 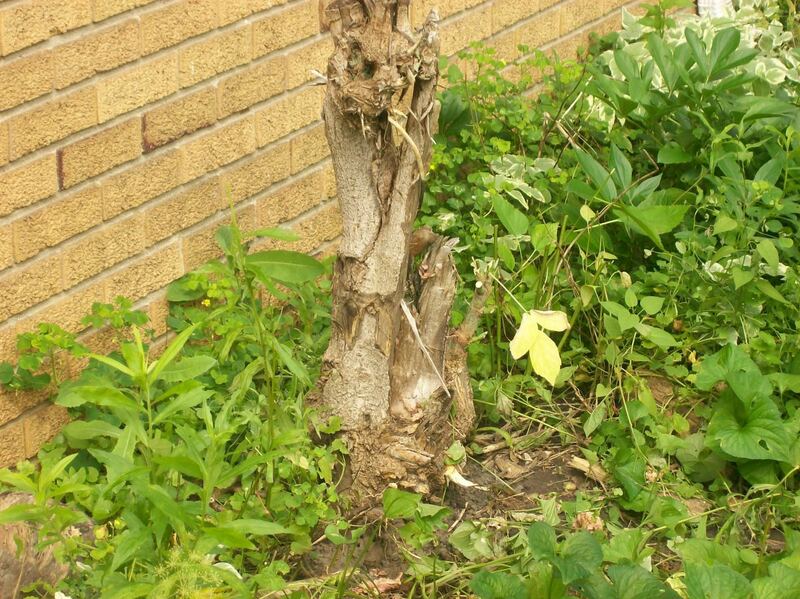 If the unwanted trees are that tall, try peeling back a large portion of bark from the trunk of each tree. You should try for a foot in length on at least one portion and then half of that all the way around. If the bark is fairly easy to peel once started, try to do the foot all the way around. If you are doing the peeling, you may want to do what you can over a period of days, so you don't aggravate your back and knees further. It will take some time to see results and a lot depends on the type of trees they are and the growing season there. Try to get several done before the season is over. I have a huge blueberry bush and a large pomegranate tree in my yard. The previous homeowners were elderly and didn't take care of them for many years. Both the bush and the tree are too large, and I think their size is causing problems with fruit production. The pomegranate is almost dead. What can I do to get rid of unwanted growth without killing the fruit trees? You said the unwanted growth is large. Would you be able to peel back a large portion of the bark from them? That would probably be the best way since you want to keep the fruit trees. The more bark you can remove, the better. It would still take some time for the excess growth to die out. I'm not sure whether it's possible to find out how long it would take with some research, but knowing the two types of trees that are the intruders will help. 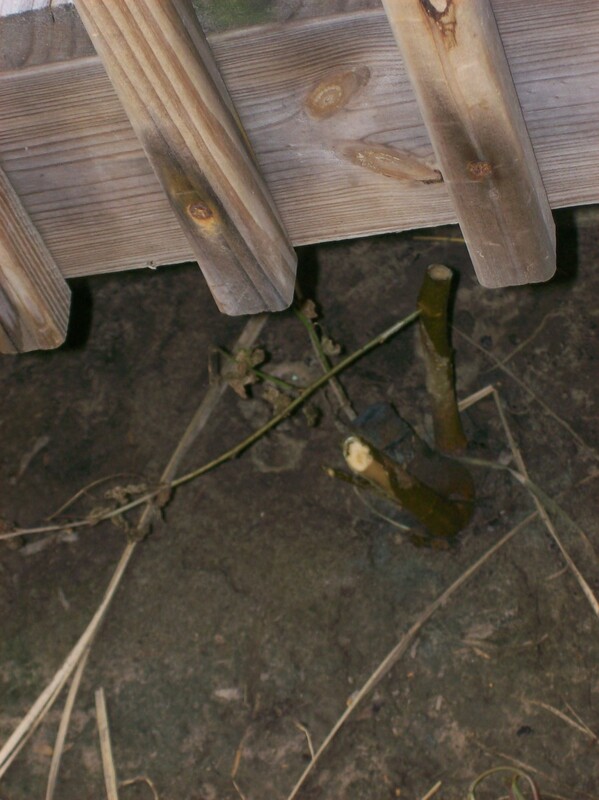 Even if the previous homeowners took care of their fruit bush and tree, they probably wouldn't have thought to look inside of each to monitor unwanted growth. We have what looks to be teeny pine trees all over the yard. Any ideas on what to do? I chopped the tree weed and drilled a hole in the expose stump, Then I carefully poured roundup in the hole. I had to do it twice for it to be effective. Thank you for this. have one on the side of my house that I have cut down for years. I read about vinegar and salt. I think I will try this method. Thank you! I am fighting saplings in lily beds. FYI, the idiom is "by the same token", not "on the same token". 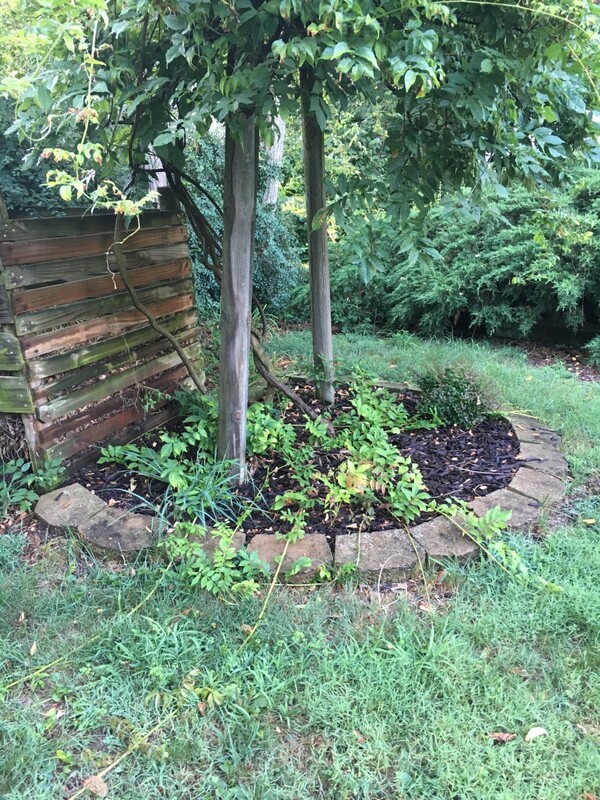 I am sick & desperately need help getting rid of sapling (4" diameter). I live on Overland in Laporte. Please. Thank you so much for this article, the city worker that had to come out and mow neighbors yard last summer told me about this, said heaven weeds grow into trees and multiply like crazy and will eventually ruin the foundation, while the ground is still wet from winter I thought I would dig all of them out from around my house, but one of them is near gas meter and has already gotten to thick and so deep to get out without marking gas lines and getting back hoe to dig it out, so I heard that a cutting the trunk of the weed as far down as I can and then boiling a pot of water with salt in it and pouring it over it will kill it,I really hope so bc these grow right at my house foundation and I believe this one roots are already wrapped around gas line and I know for sure it's under my house and foundation, my neighbor has 2 walnut trees one in front and one in back, so this article made this make sense to me, the one I was able to dig out of my back yard was large and had a lot of roots and when I finally got it dug out it had what looked like walnuts on the bottom, so squirrel bury those walnuts and causes these weeds too grow also, not just wind and birds that's what I think anyways, but ty for making me understand more about these nuisances around my home! One found under a hedge would be difficult to work with I'd imagine. It's too bad your gardener didn't see the need to get at it lower. It may be fine that it's close to the house depending on the root system, but probably keeping it away from there would be best since it's still small. I imagine there are many types of trees that vex homeowners for various reasons. In the past few years we've had the spinners from the maple trees embed themselves into the lawn. They are there by the thousands, too many to pull each of them out even though they've not rooted yet and can be removed easily. It would still be quite time consuming of a project. I found out that all that type takes is mowing them down a couple of times once they show up and that eliminates them until the next year. If we owned property where they showed up that would be a good way to replenish the supply of trees and skip that section for mowing. I found this comment earlier but didn't remember or see how to reply. It looks like maybe it changed through the years and now it's done on the notifications page only? Another tree that produces many unwanted offspring is the goldenrain tree. My house came with one in the side yard next to the sidewalk. It scatters seeds everywhere, but the seedlings are easy to pull if caught in time. The oaks from my neighbor's tree across the street are harder to deal with. One acorn sprouted right under my oleander bushes and I didn't catch it until it started growing through their tops. All the gardener did was top it off. I may try your trick of stripping the bark. It's only a few feet from the house. Great hub -- I learned a lot from this. Thanks! The pic at the top of the page called "Two larger weed trees, intertwined" is what is growing out of the center of my dead 'river birch' trunk junction... I thought it was maybe a river birch shoot, it's now over 8ft high and I just wanna make sure it's NOT a river birch shoot coming back up.... it's mostly those "split" leaves tho and river birches don't have split leaves. In fact I have that same thing all over my yard really!!! I'd think any type of paint would work. While I've done several different things to get rid of my weed trees, I don't remember whether I did the paint method or not, but if I did, I just used any paint I had leftover from projects around the house. Yes I am having thsu problem!! 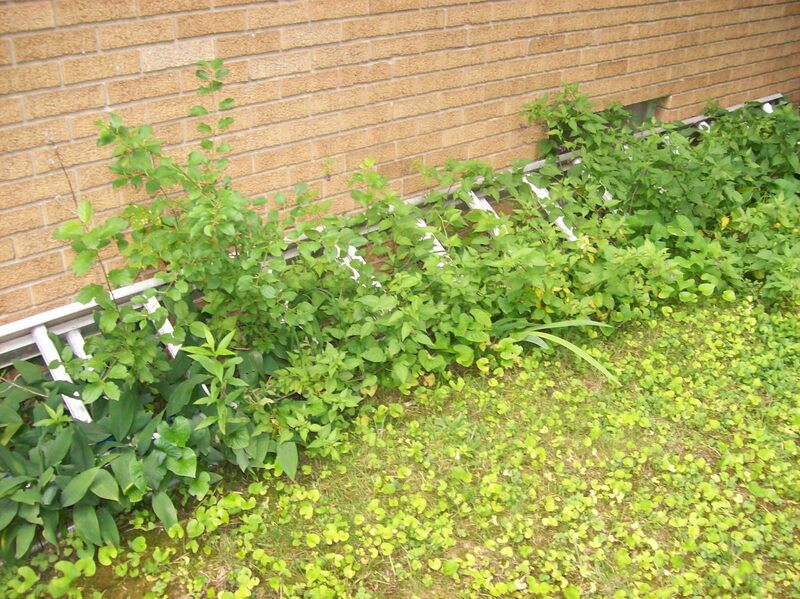 I have big tree weeds growing in my backyard and along both of my neighbors fences. They don't care but I do because I have a lot of grass in my backyard and they don't. I see you are from Michigan also, so I feel more confident on the information I have read. Many people write articles that are helpful but they are located west and are unsure if the products will work for my situation. I'm going to try the bleach for sure and paint the trucks with weed killer. Thank you so much!!! 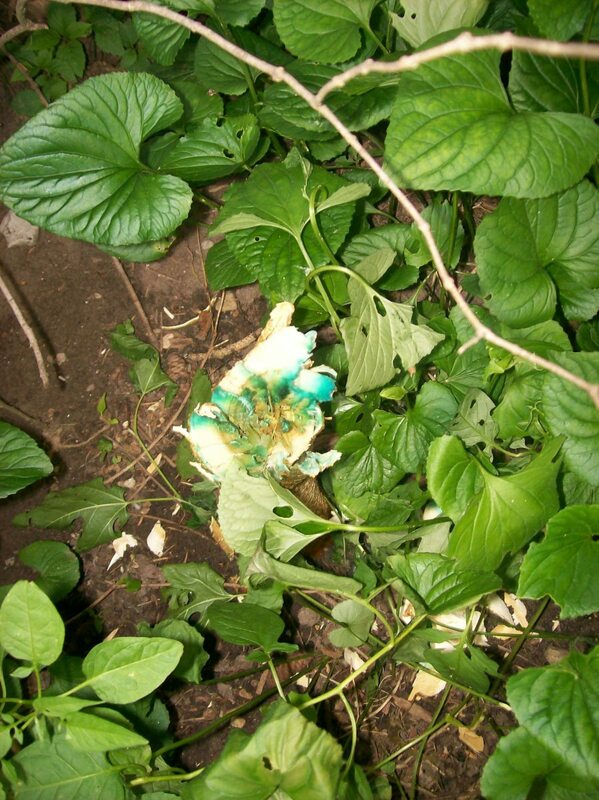 I want to try the paint method as my weed trees are in my hedges. What type of paint works best for this. Regarding the picture of two weed trees intertwined - what kind of trees are they? The bigger one is exactly what I have. Thanks, good article and well written. 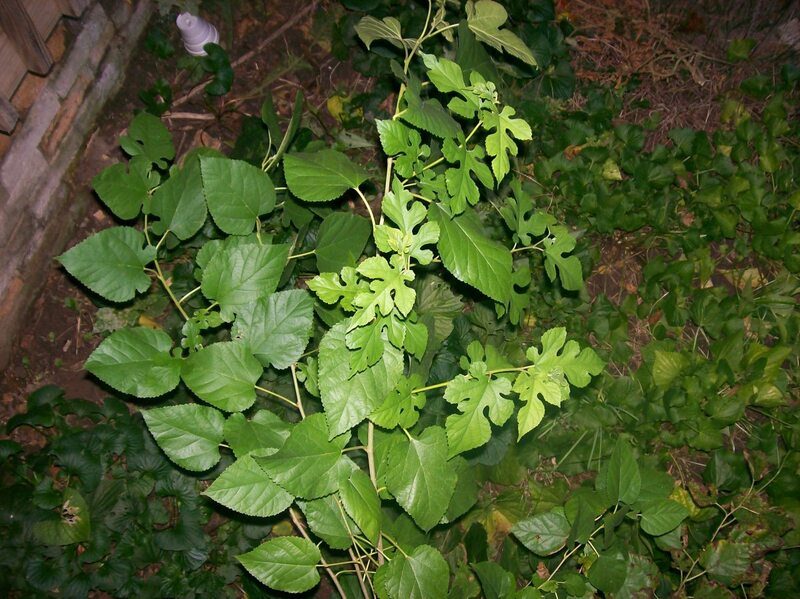 In one house where I lived, I had a severe intrusion of weed trees. I wasn't keeping an eye on them one year. Then, when I finally went out to visit the side of my house, the whole side yard was completely covered with weed trees. The only thing that could be done was cut them down. 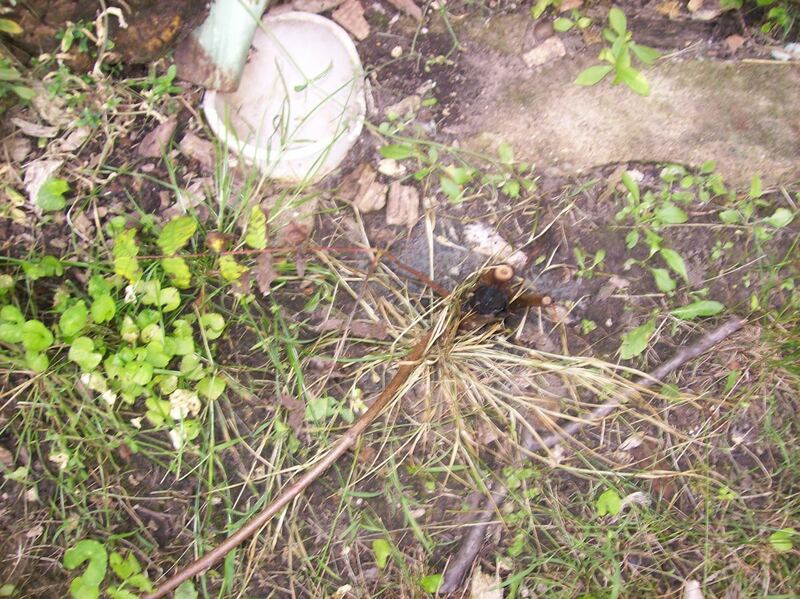 Afterwards, my husband placed tar on the tips of every "stump". It seemed to have worked. But, we moved six months later so I don't know if it was a permanent fix. 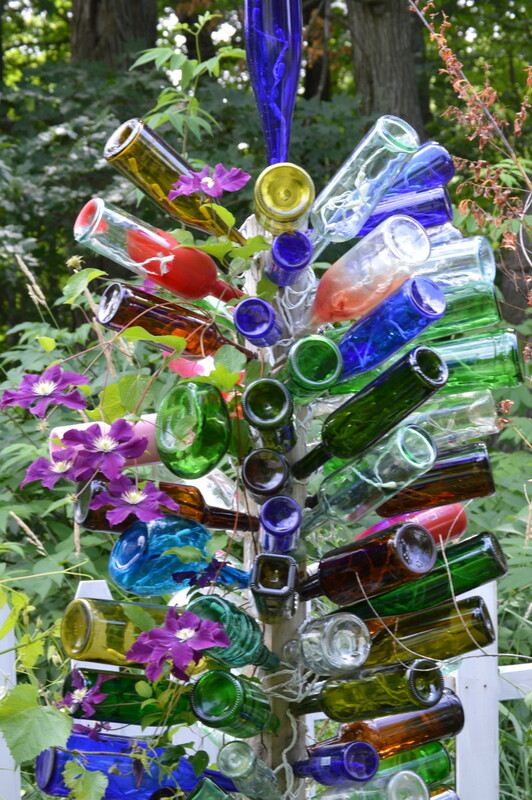 These are all great ideas for getting rid of weed trees. 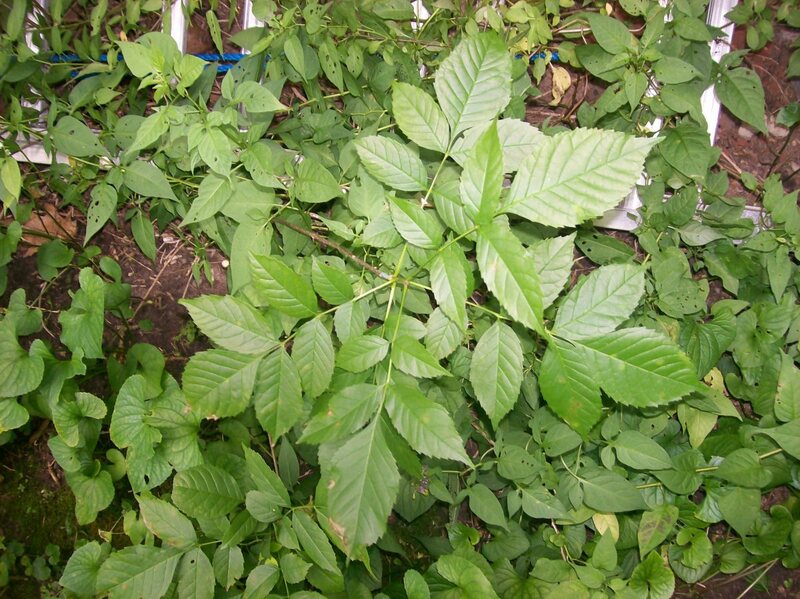 I purchased a poison specifically for weed trees, but it helps to have several sunny days for it to do it's work, and generally when I apply it, it will rain a day or so later so I won't know until next year either. I'm not sure what my weed trees are, but they are so resilient. Once, I cut one down and covered it with concrete stepping stones. The darn thing came up in the cracks! I recently tried a tip from someone I know who works in horticulture. 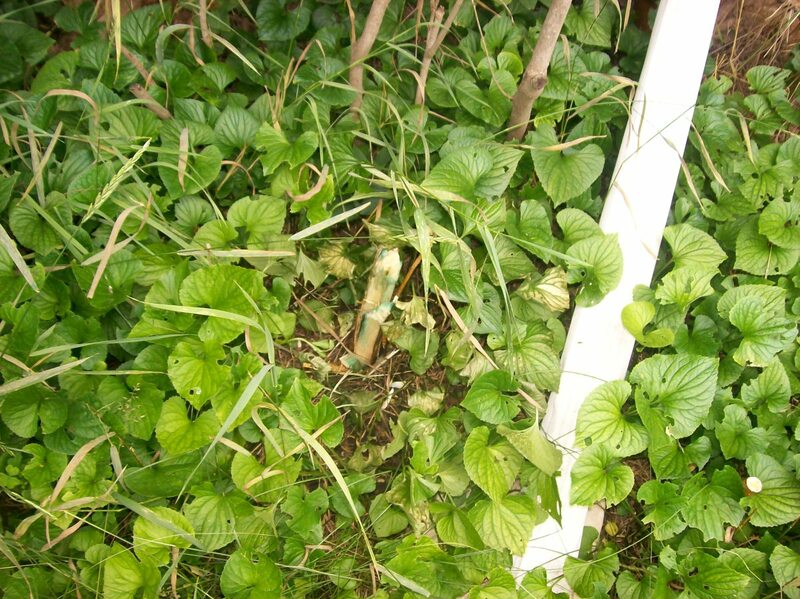 Instead of cutting down to the base, I sprayed the leaves generously with weed killer. After a few days, the thing started to die. This has been several months, and so far they still look dead. I have cut down some of what's left, and they haven't come back. My friend said the weed killer spreads to the roots to kill it. We shall see in the spring if they come back. If it worked, I'll be doing the same to more of the varmints! Thanks for the comments and suggestion about the photos. 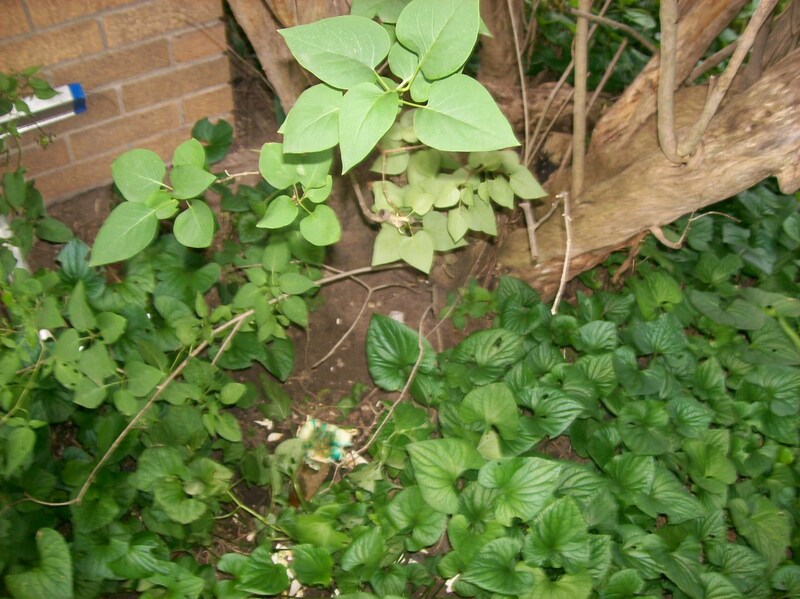 As far as getting rid of weed trees in your own lawn or garden just make sure you note where they are located and whether you hope to plant other things there in the near future. Using bleach, salt or other chemicals designed to kill these unwanted trees could also cause the ground to be unsuited for other plantings for a number of years. Sometimes, thought, that's a small price to pay in order to be rid of them for good. Unfortunately, is you use one of the means in the above paragraph, you may cause other plantings to die while the ones you're trying to get rid of still produce new seedlings at the base of the seeming dead tree. To show the photos together, simply edit the capsule, and click the checkbox that says "thumbnail." Then the photos will show small at the top, and the viewer can click them to see them bigger. Yes, I have this problem. I keep getting new trees all the time, and my yard is not big enough for any more trees! I keep cutting them down, but I'll try taking off the bark or using bleach as you did. Thanks for the vote and the comment. Glad you're kidding as I have enough to get rid of as it is. Yes, I have maple saplings around the house also, but they don't get started as often as the other ones. I'm not familiar with basswood. One of the trees I keep trying to kill may not be considered a weed tree; it's just growing too close to the garage to keep it around. Interesting, I just noticed an ad at the top of the page for a tree puller. I know I'm not supposed to click ads on my own hubs so I'll have to try to find it online later. We get weed trees all the time ours are maple and basswood. If you would like a maple or a basswood I can send them to you and you can send me a black walnut and a tree of heaven. Just kidding. Interesting hub and voted up. Thanks for the tips and comments. Mainly I didn't intend for all of them to have their own slide show, but I've learned (maybe from you) and others that is the way it's set up now on this site. I guess the album and the slideshow is pretty much the same thing? I'll have to check out your hub again for how to make the resolution below the minimum listed. I do want all of them on the hub, but not over and over again. I did find out that when I go to my photos in my page if I delete extra photos of the same things that will help cancel any duplication on specific hubs. Responding to your last paragraph about formatting photos: You can compress that string of photos (if that's what you intended) into something similar to a slideshow by using the thumbnail feature. Have you tried taking either close up pictures of the trees and leaves or cutting a small portion of the leaves off to take to a lawn and garden store. Many people that work in them can tell you what kind of trees they are. You may want to call stores in your area first and see if they have anyone there that might be able to help you. We have a small family owned store that is a grain elevator selling all sorts of things related to lawns, gardens and even pets. They are the ones I utilize for viewing what I have to determine whether they are weeds or not. Another option would be to check out online tree sellers and see if you can match any of those trees with ones they sell. There are several trees that fit the description of the tree of heaven and the black walnut and the mulberry tree is one of them. The first two are the only ones that I've had in my yard, and therefore I chose to write only about them. I wouldn't mind a stray strawberry or asparagus plant. I have a lot of wild cherry trees that come up every year. They are worth anything, because they are all pit and tiny. We have some of these trees growing along the back of our lot. The full grown trees are taller than maples and huge. Another one I hate is the mulberry tree. The roots are so deep. I did get 5 free strawberry plants this year and several asparagus that the birds planted for me. Eventually I'll give them their own spot. Thanks for the comments, but I'm not sure what you mean. Are you saying that whatever I use from ebay or amazon should be directly related to what I have written, or that I should write something about what I'm showcasing related to those products? By photo capsule are you referring to an album? I've been searching for the best way to utilize the album feature and still have stand-alone pictures in the rest of the hub, but I haven't found any instructions in the learning center, or in the forums or FAQ's or anywhere else. I may just have to remove the album and keep the rest of the pictures that I want to utilize on their own until I understand how to use that feature (album) best. Nice Hub! A few tips. 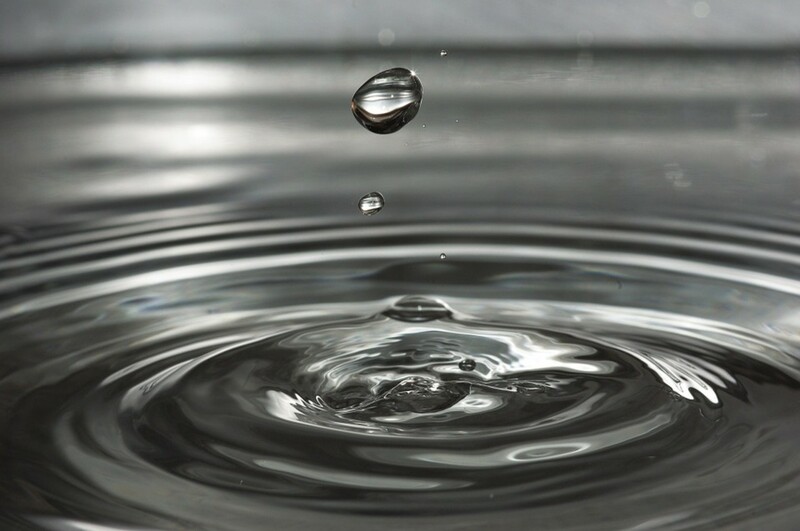 Typically using one photo capsule per picture and having them full width works best. Also, only adding products next (ebay or amazon) to where they are mentioned works best. I wouldn't add them for more content sake since they take a way from substance. This is an excellent Hub and I found it very interesting.